A 16-story apartment building, retail space and a small public park would be constructed at the “signature” intersection of Mamaroneck Avenue and East Post Road under a proposal from the Alliance Residential Company. “We’re excited about this project and believe it will contribute to the continuing revitalization of downtown White Plains,” said Alliance Managing Director Greg Belew after presenting preliminary plans for “Broadstone White Plains” during a Common Council work session this week. The proposal would create 434 rental apartments on an odd-shaped lot with frontage on Mamaroneck Avenue, East Post Road and Mitchell Place. Plans call for 16-, 15- and six-story connected buildings on approximately two acres. Neil Alexander, lawyer for the developer, said the “complex geometry” of the site allows for the taller structures to be set back far from the street. That will lessen the contrast between the new development and the one-, two- and three-story buildings that line most of Mamaroneck Avenue and East Post Road, he said. The six-level parking garage included in the plan will also be constructed in the middle of the lot, mostly out of view from the street. A small public park is being planned for the Mitchell Place side of the site, Alexander said. Located in the heart of the city’s business district, Alexander said the development will occupy “a signature intersection” and include an outdoor cafe and open space at the corner of Mamaroneck and East Post. About 7,500 square feet of retail space is also planned along those streets. “The idea is to animate that corner,” he said. Based in Phoenix, Alliance Residential Company is one of the largest real estate and development firms in the country. 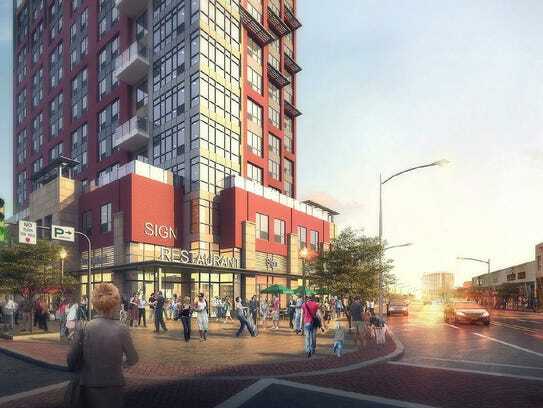 The firm is currently building an eight-story, 393 apartment building in New Brunswick, New Jersey that is expected to be completed in the spring. “We’ve had our eye on White Plains for a long time,” Belew said, adding that the city’s downtown was attractive to Alliance because of its shopping, dining and transportation options. Alexander said the project complies with current zoning and requires only site plan approval. It was not clear when a formal application will be submitted. To view the article, visit The Journal News.